This is a quick tropical-storm update for the group as activity in the Atlantic Ocean heats up this week. You might have noticed named storm Danny is no longer a threat and has been discontinued by the National Hurricane Center (NHC). Instead, it is now an open tropical wave as it approaches the southern shores of Hispaniola. However, there is a very slight chance that this open tropical wave could become better organized once again as it approaches the southern Gulf of Mexico this weekend, but this is a long shot at this point in time. The new concern is a tropical wave that emerged off the West Coast of Africa last week. This tropic wave is currently has a 90% chance of development according the NHC and should be named storm Erika by tomorrow. The low pressure system is located about 1,250 miles east of the southern Lesser Antilles. Why should soon to be named Erika be more of a concern than Danny? First, this tropical wave is at a higher latitude. Danny started out at a latitude of 10.6 degrees north while this new tropical wave is at a latitude of 14.6 degrees north, which is a better location for intensification. Further, climatology indicates that this latitude is more likely to create a U.S. threating storm. Secondly, Danny also was surrounded by dry, dusty air which limited its development in size and intensity. This new tropical wave will not have to fight as much of this dry, dusty air. Dust and dry air as Danny was forming last week. Dust and dry air as TD5 is trying to organize. Notice how much less dust and dry air is around this tropical wave versus the dust and dry air around Danny last week. Thirdly, an upper-level trough has brought a taste of fall to much of the East Coast. As the trough slowly lifts out of the East Coast this week, upper-level winds will be much more conductive to less shear in the Atlantic Ocean. ECMWF 5 day anomaly chart which suggests cooler temperatures lower air pressure (blue area) along the East Coast of the U.S.
ECMWF next weeks (Day 5 – 10) anomaly chart which suggests warmer temperatures and higher air pressure (orange area) along the east coast of the U.S.
As you can see, next week’s forecasted weather pattern is much different than this week’s. Although there is some uncertainty in the track and intensity with any named storm forecast. Overall, next week’s weather should allow what will be Erika to track much further northwest ward toward the Bahamas as a hurricane. In fact, Erika could be a major hurricane by the time it reaches the Bahamas on August 30th given the warm sea surface temperatures near the islands. It is a bit early to determine how much of a U.S. landfalling threat Erika will be, but most storms near the Bahamas need to be watched, and this will be the case the first week of September. The HWRF model, which did a great job with the intensification of Danny late last week, This model now provides a view of my general thinking as Erika tracks towards the Bahamas. HWRF modeled 126 hour forecasted wind speeds of soon to be Erika. Named Storm Fred could also develop behind Erika later this week, but let’s worry about Erika first. Updates as needed or ask if you have questions. After the long winter much of Eastern North America experienced, it is sad to say we are rapidly approaching mid-summer. This also means we are past the climatological peak of the U.S. severe weather season, and fast approaching the peak of the Atlantic hurricane season which occurs around September 10th. To many it may seem that the severe weather season has been an active one, while the hurricane season, to this point, has been a yawner. The data suggests, however, that the complete opposite has occurred. In terms of local storm report counts from the Storm Prediction Center, this year’s severe weather season has been below normal. The most noteworthy events are attributed to the above normal, and sometimes record breaking, precipitation in the Central Plains and Ohio River Valley which resulted in widespread flooding. In a normal severe storm season, defining events would be attributed to hail/wind/tornado events and not large precipitation events. According to one source, the number of flood losses, or more specifically sewer backup claims, are outpacing hail claims this season. For the 1st time, Water Damage leads Hail in Claims Opened for the 1st half of a year. Combo of sewer probs, flood & frozen pipes. As many of us know, flood damage is often excluded under standard homeowners, renters, and business insurance policies. Due to this and the overall lack of severe weather, it is not surprising that insured losses to date are also below normal. In fact, PCS wind and thunderstorm insured losses are still falling below the 10 year average ($9.3 billion) by 53.5%. As of July 9th, $5 billion in insured losses have been reported with two outstanding wind and thunderstorm events. This season, we have yet to see a marque severe weather event causing over $1 Billion in insured loss. Comparing to previous storm seasons, one has to go back to 2005 to be this late into the severe weather season without experiencing a $1 Billion dollar insured loss event. The severe weather outbreaks this season have been limited due to fluctuating weather patterns, resulting in below normal insured loss. A similar pattern, if it persists, should provide more episodes of severe weather, with less risk of tornadoes and a higher risk of high wind events (derechos) across northern states. This suggests that a marque severe weather event ($1 billion or larger insured loss) is unlikely as we finish out the season. 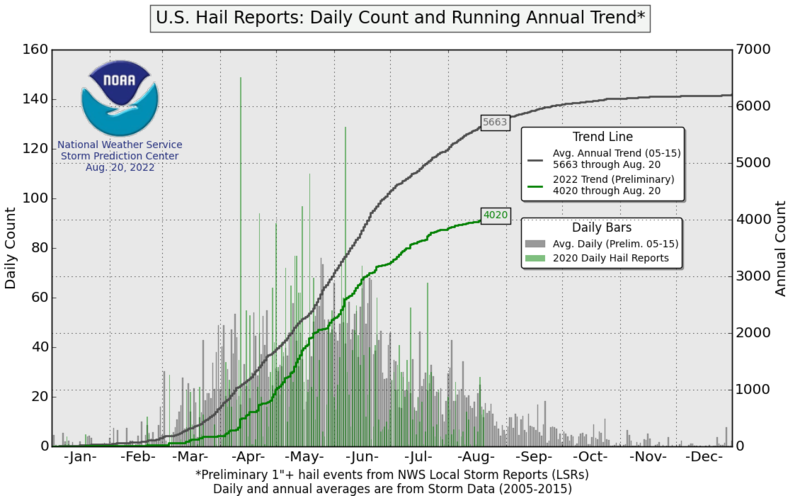 Since 2001, only one marque event has occurred after July 10th which was the Phoenix hail storm in the Fall of 2010. Although North Atlantic hurricane activity has been quiet since Tropical Storm Bill (Texas landfall, June 16th), the development of named storms is a major weather concern for the insurance industry. This year, there has already been two named landfalling storms with Bill being the first PCS hurricane event since Sandy in 2012. To see a similar landfall activity before June 16th, one has to go back to 1871. In terms of Accumulated Cyclone Energy (ACE) year to date, as of Monday July 6th , the basin was running 314% above normal. As we approach the peak of hurricane season, every day that passes without activity will decrease what started out to be a very above normal year statistically. As of July 10th, the North Atlantic ACE is already down to 157% above normal. Lowest 12 month running average of the Atlantic Multi-decadal Oscillation since 1995. This would suggest that the presence of cold seas surface temperatures in the main development region of the Atlantic basin results in less energy for named storms. The developing El Nino in the Central Pacific has created some of the highest wind shear values in the Caribbean since 1979. As a result, tropical convection is not sustainable. The Saharan Air Layer (Dust) has been very strong so far this season and should continue to be strong into the heart of the hurricane season. This will limit tropical convection development. Long range seasonal forecasts still call for named storm development regardless of the negative factors listed above. In fact, some forecasts call for the expected development of named storms closer to the U.S. coastline, similar to areas impacted by Tropical Storm Bill and Ana. In an El Nino year, insured losses are typically lower than average; however, it only takes one significant event to impact the industry. The insurance industry should keep an eye on the Madden-Julian Oscillation (MJO), which is a large scale oscillation that propagates eastward across tropics of the globe. When an area of the tropics is under the influence of the MJO, it tends to enhance tropical activity. This year already, we have seen two strong MJO pulses partially trigger two different clusters of named storm development in the West and East Pacific. Carriers can track the MJO to get a better idea of when heighten activity could start to occur in the tropical Atlantic basin. The current MJO appears to be moving into the East Pacific region now, and if it sustains itself, could enhance tropical convection in the Atlantic basin toward the second half of July. This could allow the insurance market to take advantage of LiveCAT markets to protect specific programs. The other area of concern for U.S. carriers could be Hawaii which has seen an unusual amount of hurricane activity over the past three years. Tropical Storm Flossie passed within 100 miles of the islands in 2013, and an unprecedented three hurricanes in one year passed within 200 miles of Hawaii in 2014. Statically speaking, named storms are about 3 times more likely to come within 100 miles of Hawaii in El Nino year versus in a La Nina year. Keep this in mind knowing that there is an El Nino strengthening in the Pacific. As we approach the climatological peak, I want to provide an update on the North American severe weather season and paint a picture of what the rest of the season might yield. Besides the latest round of severe flooding in the South Central U.S., there has not been a noteworthy severe weather event this year. 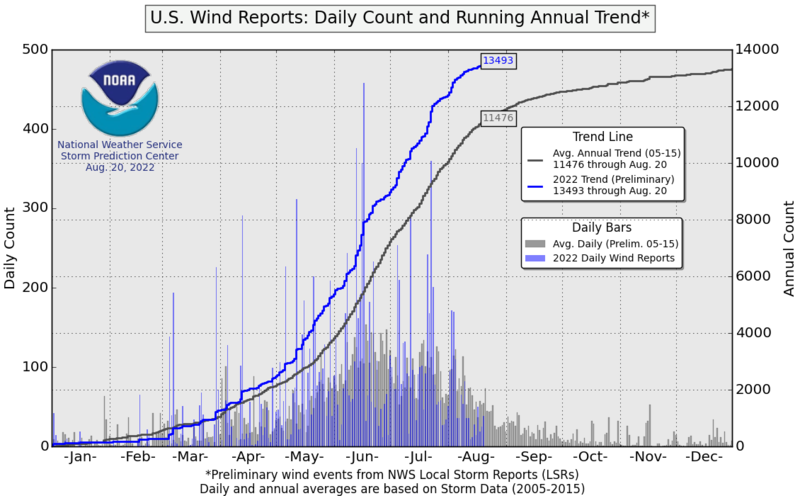 Likewise, there has not been a PCS Wind and Thunderstorm Event bulletin over a billion dollars yet. 2005 is the last year a severe weather season was without a billion dollar event this late in the season (understanding that the 2015 data is still preliminary, future loss development is likely and three events yet to have estimates issued). Overall, the loss sum of all PCS Wind and Thunderstorm Event bulletin (10) is still running 41% of what would be normally expected by this time of year. 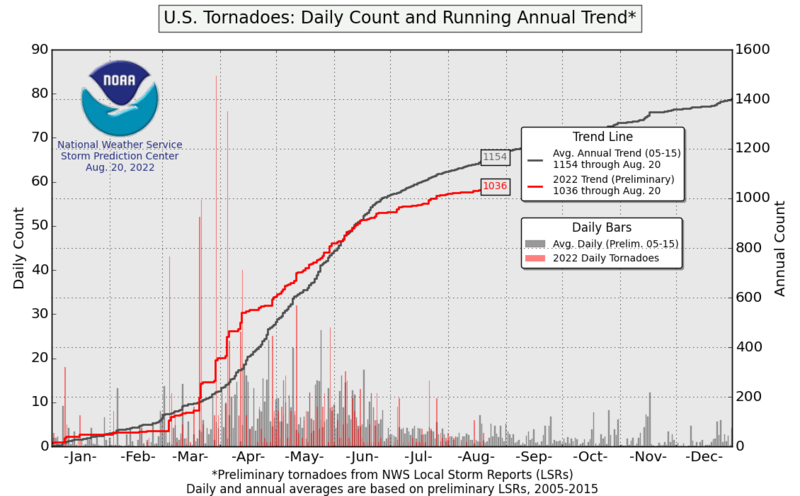 This also equates to the slowest loss start to the severe weather season since 2007. This overall lack of severe weather also shows up in the Storm Prediction Center severe weather reports for tornadoes, wind and hail, all of which show they are trending below the 10-year average report count. As you might have seen in the media, the South Central U.S. has seen its fair share of rain, which has now reversed the drought conditions that had persisted in the region since 2011. Flood damage is excluded under standard homeowners, renters and business insurance policies. Flood coverage is available as a separate policy from FEMA National Flood Insurance Program and from a few private insurers. However, with 8.8 million households in Texas and only 600,000 flood insurance policies, which are mostly coastal I suspect, the flood aspect is largely uninsured event outside auto insurance policies. As the Insurance Council of Texas told A.M. Best auto insurance losses alone are likely to exceed the Correction: The actual figure is $250m or greater (not $1bn) , there was an incorrect figure in the A.M. Best article Artemis sourced the data from. Highly correlated with this heavy rain for this time of year would be thunderstorm activity, and this region is where the thunderstorm activity has occurred. But like overall PCS losses, Texas is still running below the 10-year loss average for this time of year with total losses running at a similar level seen over the last three years with further loss development to occur with three more PCS events. We can speculate about why such heavy rains have impacted the south-central states. The heavy rains can be partly attributed to much warmer than normal sea surface temperatures in the Gulf of Mexico and an active southern jet stream flow from the evolving El Niño in the eastern Pacific. El Niño is a state of the El Niño Southern Oscillation, which is essentially a slowly varying oscillation of currents in the equatorial Pacific Ocean that can either direct warm waters towards the eastern Pacific (El Niño), or towards the Western Pacific (La Niña). El Niño conditions are now established, and I would expect El Niño conditions to prevail through the remainder of this summer and into the fall. This, combined with the warm Gulf of Mexico sea surface temperatures (concern for hurricane season also), means that more wet conditions will likely be in the cards for the Southern Plains – at least through June and possibly into July with the slow drift of storms and moisture into the Central Plains in July. Over the last two days, severe weather has returned to the Central Plains in the U.S. This recent outbreak was by no means historic but it has become the most active severe weather outbreak thus far in 2015, with eight tornadoes, 31 wind reports and 162 hail reports, 13 of which were reported as 2″or larger. Given the tornado wind damage that occurred in the towns of Moore and Sand Springs, OK, it comes as no surprise that PCS issued its first Wind and Thunderstorm CAT bulletin of the year, although it is abnormally late for such an issuance, due to the lack of severe weather. In fact, since 2000, typically the insurance industry would have experienced just over 3, nearly 4 PCS loss events with an average of $1.3B in losses by the end of the first quarter. Above is a look at the BMS iVision Verisk Climate hail size swath overlaid with the various Storm Prediction Center Local Storm Reports from the March 25 severe weather outbreak over the south-central plains. There are no official tracks or ratings of the two tornadoes that impacted the cities of Moore and Sand Springs yet – those will come later today from the Tulsa and Norman, OK National Weather Service (“NWS”) offices – but, sadly, it has been verified that the Sand Springs tornado was the first deadly storm of the season. This comes later than the 20-year average for the first killer tornado of a given season (typically, February 11), but one month earlier than that of the 2014 season, which occurred on April 25. The tornado that hit Moore, thankfully, looks to be not nearly as devastating as the same tornadoes that hit the city in 1999 (F5), 2003(F4) and 2013(F5). It is interesting, nonetheless, because it is not only the fourth tornado to hit the same general area in the last 17 years, but it also tracked in an unusual direction. The image above, created by the NWS office in Norman from the work of Tom Grazulis, a tornado historian, shows many tornadoes that track over the Moore/Oklahoma City area travel in a northeast direction. The tornado yesterday, however, tracks in an atypical southeast direction, as the preliminary NWS map below illustrates. The other thing that becomes apparent from analysis of the 156 documented tornadoes that have occurred in the Oklahoma City metro area (OKC), is this location appears to be a magnet for tornadoes – it experiences an average of just over one each year. Since weak tornadoes were not always documented prior to 1950, this number is likely well underestimated, according to NWS. In fact, Grazulis’ study confirms the OKC region has experienced 13 violent tornadoes (F/EF4 or stronger) since 1880, including the May 19, 2013 and May 20, 2013 tornadoes in Shawnee and Moore, respectively. Also through 2013, OKC experienced two or more tornadoes on the same day 26 separate times, with only three time periods since 1950 with an over two-year lapse between tornadoes. However, OKC and Moore are not the only areas that have experienced similar tornado frequency. Statistical work from Florida State University’s Jim Elsner suggests there are many areas comparable to the size of Moore with just as many or more tornadoes occurring since 1950, as shown in the image below. FSU Jim Elsner analysis of areas comparable to the size of Moore, OK with as many or more tornadoes than Moore since 1950. So, as the insurance industry prepares for the severe weather season, it is already apparent that Tornado Alley is appropriately named, since there are many areas within this region that experience the same tornado frequency as Moore. But, there is still no clear reason why, in recent years, Moore keeps getting hit by tornadoes. Studies have shown the affects of urban environments can sometimes enhance rain from thunderstorms downwind of cities (and Moore is just south of OKC), but little work has been done to determine if cities actually impact tornado formation. Future work in the insurance industry might answer these questions. Now that Arctic air has made its way across a good deal of the lower 48 states and snow had already covered 50% of the nation, the Atlantic hurricane season, and the threat of landfall along the U.S. coastline, is effectively over. The season was forecast to be below the long-term average, and that is exactly what happened, for the most part. We will likely end up with a total of eight named storms, six of which became hurricanes. Two out of the six hurricanes made it to Category 3 or higher, with one, Gonzalo, reaching Category 4 – the strongest storm in the basin since the 2011 season. While we fell short of the average number of named storms (usually 10 per year), the number of hurricanes and major hurricanes is on par with what is expected in a typical season. A better method of gauging seasonal activity, in my opinion, is the Accumulated Cyclone Energy index (“ACE”). By measuring the proportional energy of a named storm, it provides an accurate picture of how active a season might be and puts greater weight on the severity of the season as stronger storm accumulate a higher ACE than weaker storms. A typical season has an ACE value of around 104. This year the ACE score was 65.1, 62.5% of which was produced by the two major hurricanes of the season (Edouard and Gonzalo). This below-normal ACE activity follows the predictions made by most of the reliable agencies that produce seasonal hurricane forecasts. It should be noted, however, that the El Niño, which many of these forecasts believed would be the cause for a below-normal season, also failed to materialize. So, as discussed in previous postings, other factors that can lead to less storm activity, like African dust and cooler sea surface temperatures, actually did occur. As I had previously blogged, Hurricane Arthur ended the absence of a hurricane stronger than a Category 1 hitting the U.S. coastline that had existed since 2008, and came close to ending the long-standing major hurricane drought, which has lasted 3,317 days and counting. However, many have already forgotten about Arthur due to its low impact. It is also worth noting that Florida alone has not had a hurricane of any intensity since October of 2005. This is simply an incredible statistic that, unfortunately, could negatively affect the Sunshine State if and when a hurricane hits in the future due to the fact that many may have become complacent regarding hurricane risk. No other Atlantic hurricanes threatened the United States this season. However, there were indirect effects, such as high surf and rip currents from Bertha and Cristobal east of Cape Hatteras. Amazingly, at odds of 500-1, the small 20 square mile island of Bermuda was the unlikely recipient of two direct hits from named storms this season. Fay and Gonzalo both passed right over the island, causing power outages and some damage to buildings. Bermuda fared very well considering the impact from two systems less than a week apart, partially due to the strict building codes that have been followed and enforced, which is an important lesson for the insurance industry. Another lesson from this event is that hurricane clustering is real, as was also the case during the 2004 hurricane season. At any time during a given season, prevailing wind currents that steer storms in a direction can get locked in place. This may cause storms to track repeatedly over or near the same area, triggering multiple storm losses in a given season. This storm clustering was also experienced in the East Pacific hurricane basin, which was exceptionally busy and produced a few hurricanes that impacted the Baja Peninsula and Mexico with either direct hits or leftover moisture. Three of these events, Norbert, Odile, and Polo, provide another great example of storm clustering. Storm clustering also occurred near the Hawaiian Islands and the south coast of Japan, which saw four typhoons this season. Important insurance lessons also come from Hurricane Odile, a major hurricane that directly hit the resort city of Cabo San Lucas, Mexico. Although the overall wind swath and configuration of the Baja Peninsula seemed to minimize Odile’s impact, resulting in an industry event below $1B USD, there is a likelihood that the storm’s strength, with a preliminary pressure of 930 mb, will trigger the MultiCat 2012 cat bond, making it only the second cat bond to be triggered due to a tropical cyclone. This shows that alternative risk transfer products can work given the right insurance structure. The other insurance lesson learned from Odile is related to losses that go beyond basic building damage. There were numerous examples of looting in big box stores like Costco and Wal-Mart, as well as other small stores. The business interruption also was significant. I personally canceled a holiday in the beginning of October because of a lack of facilities, which adds up when thousands of others do the same, resulting in hundreds of millions of dollars in lost income to the tourism industry. While it’s too early to suggest what might occur during the 2015 Atlantic hurricane season, and although the current hurricane drought is exceptional, it is important to remember the long-term hurricane risk remains the same as it has been over the last century. BMS Analytics is here to help clients prepare for an active season by providing the newest tools and knowledge gained from past seasons, regardless of the overall low impact the past several seasons have had on the industry. The strongest earthquake to strike San Francisco’s Bay Area in 25 years was recorded on Sunday morning. The U.S. Geological Survey (“USGS”) registered a magnitude 6.0 tremor at 3:20 a.m. local time, with an epicenter located 5 miles south/southwest of Napa, California at a depth of 6.6 miles. The insurance industry is just starting to grasp the complex nature of the Napa earthquake losses, but it is important to note that this might be the first earthquake in California to utilize some of the newest geospatial technologies, allowing companies to immediately understand the risks exposed and produce damage estimates based on the magnitude of shake intensity. Despite the shaking, damage, injuries, and fear, thankfully this earthquake wasn’t “The Big One.” But, the South Napa earthquake provides a good example of how magnitude is important when analyzing an earthquake’s impact to the insurance industry. Earthquake magnitudes are on a logarithmic scale. Each integer number increase in magnitude reflects 10 times more ground motion and 32 times more energy released. While it sounds like a magnitude 6.0 and a magnitude 6.9 are close enough to get lumped into the same category of earthquakes, the impacts of each are dramatically different. For example, the Loma Prieta earthquake (M6.9) of 1989 was more than 22 times stronger than Sunday’s magnitude 6.0 event, illustrated below in a comparison of two ShakeMaps from the USGS. ShakeMaps from Loma Prieta Earthquake vs. South Napa Earthquake. It was only 20 years ago, but we often forget that the 1994 Northridge earthquake was on an unknown fault system. Early reports suggest the South Napa earthquake could have come from an unknown fault as well, which emphasizes that the focus should not always be placed solely on the well-known San Andreas Fault. According to the California State Geologic Survey Map within the Bay Area, the main San Andreas Fault cuts through San Francisco and sections off Point Reyes. However, many other faults within the zone are also prominent and active enough to earn names. The Hayward Fault, Rodgers Creek, San Joaquin and Green Valley are the structural underpinnings of the long valleys characteristic to the region. What may be surprising, however, is that many of the small faults don’t have names at all, especially if they haven’t had major damaging activity in the recent past. These faults should also be considered by not only the modeling companies, but the insurance companies that write the risks. Further, the industry needs to keep in mind that the location of the epicenter is critical to determining expected damage and, so far, most of the major quakes in our lifetime have not been located under major population centers. Sunday’s earthquake appears to have ruptured on or just west of mapped traces of the West Napa Fault, which has ruptured sometime in the past 11,000 years. The most seismically active areas have been between the longer Rodgers Creek Fault on the west and the Concord-Green Valley Fault to the east. It’s entirely possible that this earthquake occurred where the fault was covered by sediments, with recent movement that we didn’t know about until today. It’s important to reiterate that many faults have been active in the past 2.6 million years. However, numerous more are inactive and countless are still unknown. California State Geologic Survey Map of Faults. Early reports suggest damage is localized in the region surrounding Napa due to the rupture directivity to the northwest. River valley sediments in Napa Valley likely contributed to the amplification of shaking around Napa. Major river systems in the area are another factor that should be considered when analyzing the potential consequences of California earthquakes. While it seems unfair that California is getting hit with two disasters – the ongoing extreme drought and now a substantial earthquake – this overlap may actually be a good thing. As mentioned in other studies, if this earthquake had happened when water was more abundant, the aging levee system protecting islands within the Sacramento Delta would have been saturated and vulnerable to liquefaction during the earthquake. If those levees succumbed, their inundation would have drawn saltwater from the bay up into the delta system, which could have caused saltwater to reach the California State Water Project intakes. Considering the Delta is the water supply for two-thirds of Californians and supports central valley agriculture, contaminating the water intake would have been disastrous. That’s not the only relationship between the drought and earthquakes. Recently published research suggests that groundwater depletion in the San Joaquin Valley is linked to crustal flexing in the adjacent mountain ranges, potentially increasing seismicity of the region. Now, as a forecaster of the weather, sometimes I get asked “what is the latest state of forecasting earthquakes?” This is a common question, particularly after an earthquake such as this. There are currently various unknowns when trying to determine if this earthquake adds or reduces stress for “The Big One.” The bottom line is that it is impossible to predict the exact timing of an earthquake. About every six years, the USGS updates its hazard maps to incorporate the latest geoscience research. The new USGS hazard map reveals that 16 states are at high risk of damaging earthquakes over the next 50 years, and these states have all historically experienced earthquakes with a magnitude 6.0 or higher. Some of the biggest changes have come in the Pacific Northwest and in California, where research has identified several areas capable of having the potential for larger and more powerful earthquakes than previously believed. A 2008 USGS study determined that the probability of a magnitude 6.7 or larger earthquake occurring within the greater Bay Area in the next 30 years was 63%. When the impact of the South Napa earthquake is included in the next batch of geophysical models for the region, those probabilities are likely going to stay the same. The earthquake released energy, but not enough to appreciably relieve tectonic stress within the region. It would take many more earthquakes of similar magnitude 6.0 to relieve the same amount of energy as just one magnitude 6.7 earthquake. Two weeks ago, Hurricane Arthur made landfall along the North Carolina Outer Banks. Arthur was the strongest hurricane to make U.S. landfall since Hurricane Ike in 2008 and was just 13 mph shy of ending the U.S. major hurricane drought. However, the overall impact of Hurricane Arthur was diminished due to the strongest winds being on the right side of the storm as it crossed eastern North Carolina, as discussed in my previous blog post, resulting in less overall damage. While damage was reported, and up to six feet of storm surge was observed in parts of the Outer Banks, most damage seemed to be flood-related and will be picked up by the NFIP, resulting in a loss level that falls below PCS CAT designation guidelines. This is notable for several reasons. When reviewing the extensive PCS records of both U.S. hurricane landfall and hurricane loss, Hurricane Arthur is the second Category 2 hurricane to make landfall and not have a PCS designation. The only other storm in which this situation occurred was Hurricane Gerda, which made landfall in the extreme northeast portion of Maine in 1969, making the lack of designation understandable given the limited exposure across this region. However, according to Corelogic, there are an estimated 23,215 residential properties in Kill Devil Hills and Morehead City, NC where Arthur made landfall, with a total replacement cost of $4.7 billion. Based on Verisk Climate Respond weather data found in the BMS iVision Historical Events Library and using the unique PCS shapefile for Arthur, it is remarkable that a Category 2 hurricane in this area that had three-second wind gusts over 70 mph would not cause a PCS loss of at least $25 million. Particularly since there have been previous storms that have taken similar tracks and caused PCS-designated losses in the past. BMS iVision with Arthur’s track and estimated three-second wind gust swath. Although each named storm has special attributes that may cause insured loss, the general characteristics that drive loss are similar. However, as the image below illustrates, there were five hurricanes that occurred between 1955 and 2012 that tracked within 30 miles of Arthur’s path across North Carolina’s Outer Banks. These five storms all produced PCS losses, even though they had similar or weaker storm strengths than Arthur at landfall. Five historical storms that have tracked within 30 miles of Arthur’s track and caused PCS loss. More significantly, when looking at the past named storms from 1955 to 2012, 35 have caused PCS losses in North Carolina, with many of the named storms making impact at or below a Category 2, and several storms tracking hundreds of miles away from North Carolina, such as Hurricane Sandy (2012), which tracked 273 miles east of the Outer Banks. Click here for a linked table to these storms, which can be reviewed using NOAA’s Historical Hurricane Tracks tool. The image below provides a view of four of the named storms that caused PCS losses in North Carolina. Tracks of four of the 35 historical storms that have caused PCS to North Carolina according to PCS data. The examples above illustrate that North Carolina’s Outer Banks are no stranger to named storm activity, with the expected landfall return period for this area being five years, and major hurricane return period being 16 years, according to the National Hurricane Center. This has allowed the Outer Banks to better prepare for future named storm losses. The good news is that after years of storms, a Category 2 hurricane making U.S. landfall and having minimal impact demonstrates that insurance companies are becoming more risk-averse and policyholders are either constructing or reconstructing buildings at standards that reduce loss. One can only hope that future hurricanes making landfall along the U.S. coast will produce similar results.